One of my favourite hobbies is to trek and climb the Alps and do ham activity wherever I reach. 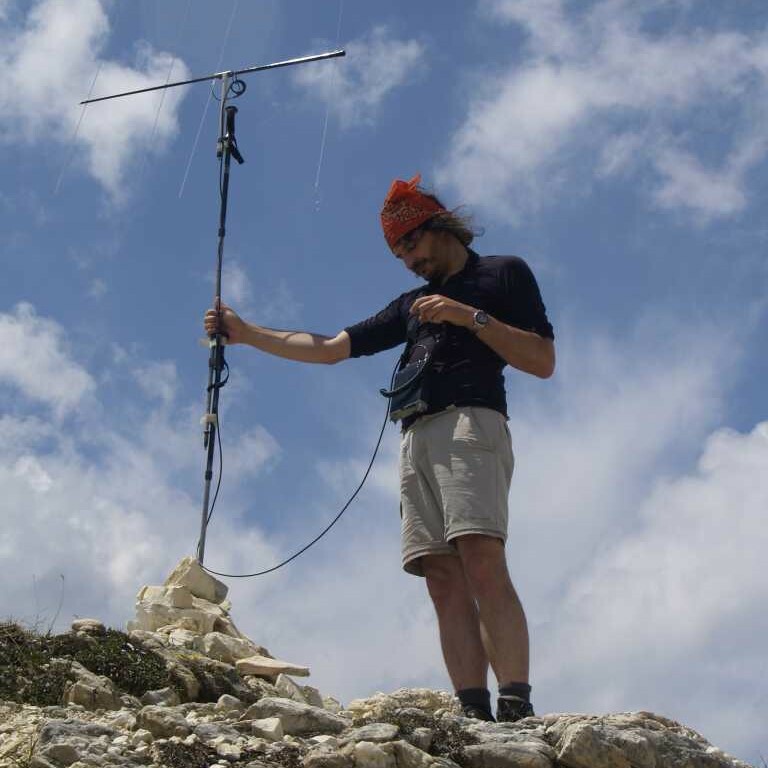 During the warmer seasons, I often reach high summits: what better place for some VHF activity? So far I worked with a 4-elements 1m long Yagi-Uda that I designed and built myself with plastic and aluminum tubings. This antenna did work, although it got some problems. Initially all the elements were in a single piece and, once packed, the whole assembly was about 1.3m long: when tied to the backpack, it kept on tangling to the lower branches. So I cut in half and threaded all the elements: now it was shorter, but it took an annoyingly long time to be reassembled and it required a clean area where to work. Last but not least, it was heavy: over 600g. The new antenna is extremely simple, easy to build and cheap. The boom is the second thinnest element of a 7m fishing rod that I had spare from another antenna. This element is about 1.05m long; it diameter goes from 8 to 15mm and it is not critical at all. Elements are aluminum TIG soldering rods: 2.3mm of diameter, almost 1m long, these objects are light, thin and flexible. A bought a 1 kg box for a few Euros and it contains about 80-90 of them. 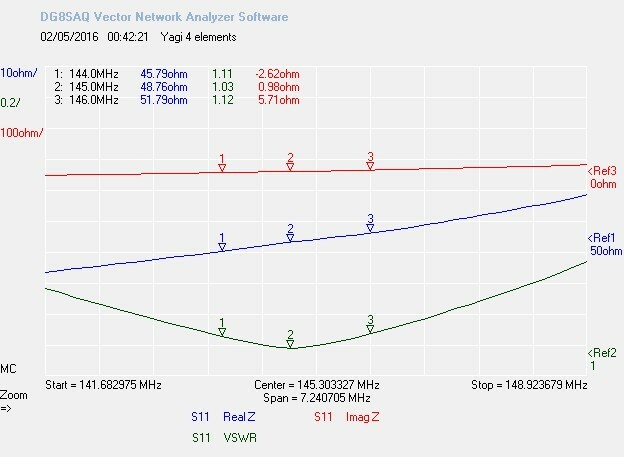 I designed this 4 element Yagi-Uda using the <href=”http://www.qsl.net/4nec2/”>4NEC2. I love this tool because if correctly used, it is so accurate that I can cut directly the parts at the exactly calculated length and they will do work immediately as expected, without any further tuning. I wanted 50 ohm at the feed point and a boom length that would fit within 1m. As described before, the boom is a 1m long fishing rod segment. The elements are mounted in four pass-through holes drilled across the boom itself. Well, drilling eight holes, aligned on the same axis lines on a conical object (as a fishing rod is) is not that simple. Here it this the procedure I followed. First, put the rod flat on a table and mark, on both edges, where it is touching the plane below. This gives two points that are aligned along the rod side. Using a thin string pulled along the rod and aligned with the marks, pin the position of the holes on one side. Then repeat on the other side of the rod. IMPORTANT: do not drill both holes at once: being the rod conical, the hole below will be off center! Drill first the holes on one side, then the holes on the other side of the rod! The main problem with the radiator is how to make a safe and strong connection between the aluminum rods and the copper RG-174 coax: as we know, aluminum is not very tin-friendly. Instead, I experimented a crimping technique that proved very easy and effective. find something that can hold all that parts together; I used a PVC profile, “U” shaped, 4×8 mm, 3 cm long; solder the RG-174 center to the copper wire and put everything in place. With a pencil, I drawed a line on a flat surface and temporarily taped the rods in place to keep them flat and aligned (E). The parasitic elements (a reflector and two directors) are very simple: just cut your rods to the right lengts. I wanted to add a blocker to each element that stopped the bar at the right position once inserted in the boom. I cut a small slice of the external cylinder of a rivet of the right size (1). Then using a crimping tool (2) I crimped the slice on the element (3); maybe it can be done with pliers as well. On the other side (4) I used some small caps used to close unused holes in furnitures; with a cutter I cut a cross-shaped hole an they work perfectly to hold the element in place on the other side. IMPORTANT NOTE – The antenna center is not along the boom: being it non-conductive, it can stay off-center; rember to fit the blockers at the right positions considering that. I used a small PVC T-shaped fitting for electrical conduit filled with foam rubber; this gives a nice grip on the fiberglass rod and allows rotation to change polarization. A small choke (3 turns over 33 cm of RG-58) completes the feedline. Note that the choke is on the external feedline: in this way the antenna parts can fit inside the boom when not used. Once dismantled, the antenna fits completely inside the fiberglass boom. The data below has been measured with DG8SAQ’s VNWA3 vector analyzer, SOL calibrated at feedpoint. This antenna is perfectly usable on all the 144-146 range and more, with VSWR ranging from a minimum of 1.03 at 145.0 MHz to a maximum of 1.12. This antenna proved extremely cheap, light (83 g), robust and easy to build. It is very easy to assemble and dismantle even in hard climatic conditions. Actually, the fiberglass mast and ultra-thin elements combination is so effective, that I built a 144 MHz 10 elements long-boom Yagi (5 meters long) for fixed use that is permanently installed at my QTH, still in perfect conditions despite of wind and snow. It is so thin and light that everything will do as a mast: I normally use my trekking poles stacked one ontop of the other (with Velcro straps), so I reuse weight I am already carrying. Matt KØMOS built one its portable antennae following this project and tested it at the Colorado 14er Event. Here it is his report. Ciao, questo design e’ eccezionale, stavo per realizzare qualcosa di simile quando ho trovato il tuo articolo su Internet. Le bacchette TIG che ho a disposizione sono piu’ corte del necessario per implemetare il riflettore ed anche l’elemento radiante… tu come hai fatto? Ho usato un piccolo cilindro di ottone che ho crimpato sulla punta estrema della bacchetta TIG allungandola così quanto basta. Sono dei cilindri di ottone lunghi circa 1cm che ho trovato in qualche fiera e dal diametro interno di circa 3mm, tipo i cilindri a crimpare dei connettori. Si può fare lo stesso con altri elementi cilindrici crimpabili, come i rivetti una volta liberati del loro chiodo.